Story: I love the movie - 'My Big Fat Greek Wedding'.... The story is about a middle-aged Greek-American woman, Toula, who falls in love with a non-Greek. What makes this movie charming is not its "ghisa-pita" plot, but the way it paints a genuine picture of an immigrant's life in America. For example, the constant urge of an immigrant to try and relate everything they see in the US to something from their homeland. This scene - "Give me any word" captures that urge beautifully. It is amusing to experience the same urge when we try new cuisines.. it automatically makes the Indian in me say things like - "Oh.. this Couscous.. it's exactly like Fada or Daliya or Upma"
Recipe: A note on Fada vs Couscous.. from what I have read, the cracked wheat or Fada or Daliya that you buy from Indian groceries is less processed than the couscous that you can buy in American groceries. So for similar grain sizes, couscous will take shorter time to soak as compared to Fada. I guess if you are using Fada - follow the soaking and cooking process recommended on our Kitchen Kabinet and if you are using American store bought couscous with small grain size - continue with this recipe. Soak the couscous in 4 cups of cold water for an hour. The grain should feel soft to touch. Squeeze out extra water from the couscous. Now boil 1 cup of water, add to it the turmeric powder and coriander powder. Mix this water into the couscous. Keep this mixture covered for 15 minutes. Separate the grains with a fork. Now add olive oil, lime zest, lime juice, all the veggies, raisins, parsley and salt. Mix well. If you have made the chatpate chhole, you can add those now. Preferably keep this covered for a few hours before serving. Garnish with the toasted sesame seeds just before serving. Goes very well with fish.. We had this with Swordfish Kabobs the other day. mmm... will definitely give this one a try! 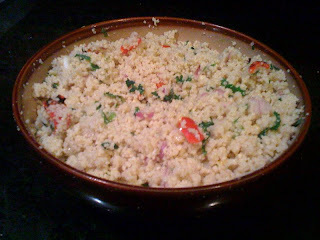 I'm getting tired of my usual cous cous recipe. :) what is your usual recipe? may be I can try that sometime. Where I can But couscous in pune? Cous cous is Daliya or cracked wheat. I believe it is also known as Faadaa. You should be able to buy it in regular grocery stores. Thanks for stopping by..